Network Plus (+) N10-006 exam certification by CompTIA proves knowledge of networking features and functions and is the leading vendor-neutral certification for networking professionals, addressing the latest skills needed by technicians, such as basic principles on how to secure a network as well as more advanced topics such as network technologies, media and topologies, devices, management, tools and security. In order to earn your Network+ Certification, you must take the Network+ exam at an authorized Pearson VUE testing center. DCI's Network+ exam vouchers which will allow you to take your certification at an authorized testing center. We also offer learning materials and practice test to give you everything you need to earn this certification, while saving money. 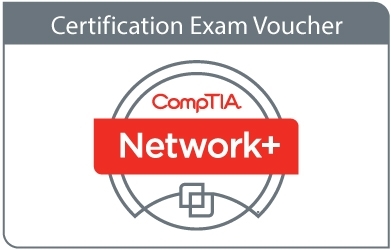 You can save even more money on Network Plus certification by purchasing vouchers, allowing you to take the exam sooner. Browse below to find everything you need for CompTIA Network+ certification.